Palm trees at the airport. This was not skiing country. My family and I spent the evening laughing nonstop as we compared do-you-remember-whens between our parents and the oldest and youngest siblings with me in between. Good times. And as Mom pointed out, her parents were married 72 years; they’ve got twelve to go. Cold climate. Warm hats. Hmm. The warmest one not given away yet will match some of what I packed to wear, at least. There’s one on the needles but I suddenly realized while knitting at Purlescence tonight that they’re on gold-plated needles that I’m not going to risk around airport security. My sweetie and I got married when gold hit its then highest-ever, totally unheard-of price of something like $360 an ounce or so, and that’s just the metal in the wedding bands. Richard and I were students. Richard’s dad had always wanted to try this: he had a bad tooth, Richard had a bad tooth, and their gold fillings had fallen out multiple times. His dad had kept the gold. And so, he got our ring measurements and they melted them down for us: voila! A piece of themselves being put into our happily ever after. To me it said I was marrying into a creative and kind family. I’ve always thought it was great. Fast forward umpteen years. Michelle was in middle school. Someone put some knitting needles on the market that were gold plated, not brass like some of the later ones but gold, and I pointed them out to her and got her to buy me a pair of size 5s for Christmas. It was totally a setup. I was so sure that gold at $360 was engraved in the back of his head. Richard watched me open that package that morning, and in that moment Michelle and I both saw it in his face: *gold*? Needles?! Isn’t that taking this knitting obsession wayyy beyond redemption? He was in shock. The gold is about half worn off the metal ones by now.Â They’ve been put to good use. And they are staying home tomorrow for their own good. Not much to write home about stylewise but it is soft. I wanted to make sure a head could get through there and that the arms had lots of room to move around in, since the sheared-mink yarn has no give to it; I erred on the side of baby movement, carefully measuring the casting-off around the neck as I went, and nope, ripping it back and making it looser. Now, I know that superwash-treated wool willÂ shrink back to size as it dries. I have no idea what mink will do. If it doesn’t, well then I just made a sweater that will fit that sweet baby next winter. Which is all good, too. I got the ends run in on project A, project B, got a few sweaters washed and slowly drying for my flying to a colder climate, trying to get ready to go to celebrate my parents’ 60th. Looking for something else after dinner, I stumbled across the utterly forgotten sheared-mink baby sweater. I so wanted to give this to my namesake great-niece. I so wanted it already finished. It’s going to be so nice when it is. The front was done, the back was done, lots and lots of dangly ends to weave in (oh fun), seams to sew, edges to add. Two rows. Five rows.Â Eight rows, glancing at the clock repeatedly, feeling I must really be in the zone because I’m getting this done in record time with the hand barely moving on that clock. And another row, and I looked up again. And just for silliness, I can remember my Dad buying a box of Hostess stuff once in my entire life (at the Giant or whatever it was called then on the Pike, Dad), Mom, never. But there is this recipe for what their cupcakes could have attained to, had they ever been allowed to grow up like we kids did. Instead of the coffee, this good little Mormon girl would try it with cocoa nibs boiled in milk and allowed to steep awhile. Should be interesting. Michelle got up at 4 am again, Eastern time no less, to catch her flight. We had to set the alarm ourselves at our end. Richard turned right out of the neighborhood. Wait, what? She’s at San Francisco, right? I dropped her off at San Jose airport, he answered. She’s at San Jose. We knew by then that her flight had landed 35 minutes early and she was already on the ground and we were running behind as it was, but going the wrong way wasn’t going to help anything and arguing would get me nowhere since I wasn’t the one driving. So I pulled out my cell and started texting: SFO, right? Yes SFO! I sent you my itinerary…! (I knew that, especially because I had written it down in my calendar: if I write it I remember it.) She says SFO. Right, then. Left at the light and back thataway to the next northbound exit. I knew she was just sitting there waiting so I tried to help keep her company: We’re on 101 north now. We’re at San Carlos now. Good to have her home again. I glanced up at the clock and thought, I was going to stop knitting and go do a blog entry five minutes ago. …I was going to stop knitting and go blog half an hour ago. …I was going to–eh, it’s been almost 45 minutes, we have to get up early to pick Michelle up at the airport, I’m running out of time in the day and my hands need a break anyway. Oh, and, Ellen’s right; baking that fleece would definitely be the way to go, clearly; the only thing standing in my way of just going and doing that yesterday was the simple silliness of I had never done such a thing before. If I had a hot summer day and a dark car and a black plastic bag to intensify the effect, it would do it. All those warnings about leaving kids or pets in cars in the heat? Works on bugs too. But even in California, this is November. Years ago, at CNCH, a weavers’ convention, I bought a baby mohair fleece from the woman who had raised Edgar–and talking to her and seeing the love in her face as she described him, he was clearly more of a pet than anything else. It was a fabulous fleece, her best, and I made several skeins and a few small things out of it. I remember waiting for my kids to get out of middle school while I would sit, picking out the random bit of hay or the like and letting it float off in the breeze. There wasn’t much, but still. Opening those locks and spinning that stuff took a lot of work. Edgar the goat would be a teenager himself by now. I still had some. Who knew. And the bag it was in had come undone and opened, with the dreaded signs of infestation–not bad, but. Any is the end, you have to toss it. End of subject. My second reaction was, but I fondled all that woman’s fleeces before choosing; she had the best in that whole show and she told me I’d picked the best of her best. It is so very very soft. And I do have my wheels in working order again, with thanks to Kaye and Sandi at Purlescence. Helpful hints for your significant others: qiviut blend yarns starting at $9.95/25 g/200 yards of laceweight, very soft stuff, and this giveaway on cottagecraftangora’s blog. Way more fun than beating back the crowds at Crazed-Mart. We got a note today from the friend who, a little to my (albeit grateful) surprise given my recent flu, had invited the two of us for Thanksgiving, even after finding out Richard had had a fever on Sunday: her email said carefully, tentatively that she’d found her daughter had invited a friend who had a newborn. How was Richard doing? He’s fine, I told her, I’m the one that hasn’t entirely shaken my germs off. I told her not to feel guilty; keeping a newborn healthy was far more important–just like I like people who are sick to stay away from my immunocompromised self. It was the right thing to do. So here it was Wednesday. He and I looked at each other and I decided I felt better than he did–I wasn’t the one who got up in the middle of the night to drive to the airport. Trader Joe’s it was: cranberry-stuffed turkey breast, which will leave us with plenty of the obligatory leftovers. Pecan pie for me, am absolute must, pumpkin for him, the only real Thanksgiving pie as far as he was concerned. Frozen gratin greens, totally cheating boxed turkey gravy and scalloped potatoes–and a sugar pumpkin for the sake of the possibility of homemade. There you go: Thanksgiving dinner for the energy-impaired. Bake an hour-ish. Boil a bag of cranberries and a cup of sugar and a cup of water (or orange juice) for one minute if we want sauce. And since pecan pie is not necessary for the real dinner as far as he was concerned, we didn’t have to wait to try it. Michelle snagged a cheap flight to go spend Thanksgiving with the Texas relatives. My sweet Richard offered–cheerfully!–to get up at 4 am tomorrow to take her to the airport and insisted I should sleep in. And he and I saw a Cooper’s hawk perched on the telephone wires across the intersection while we were stopped at a light this afternoon, so we could both get a good look at it. Very cool. Fly well, everybody. Have a very happy Thanksgiving. It was a little after ten p.m. Richard’s back was bugging him; no problem, my turn then. The light out that side burned out years ago and somehow we just never seem to remember to replace it–actually, we couldn’t now, not that obsolete type. Eh. I could barely tell where the dark plastic trashcan was to open the lid–okay, there, over you go. I always have this guilty feeling that I must be clonking some poor raccoon in the head when I do that. Meantime: fussy pattern, super-splitty fussy yarn. Bad combination, and I’m still dragging; I didn’t want to be bothered with it. I ripped and started over. Nice, plain purl rows–no purl two through back loops stuff. I didn’t want to be no stinkin’ fancy-pants designer tonight, I just wanted to knit. And then I had to go off on a tangent and make it come out a new way anyway.Â It’s coming along nicely now. I quite like it. A certain daughter of mine who took ballroom dancing in college (and who, unlike me, is quite good at that sort of thing) cracked up when I pointed out this comic. Heh. Meantime. A follow-up re the peregrines: Haya fledged from the bridge between Oakland and Alameda a year and a half ago and was later found shot. She has had three surgeries and been through long, long training and rehab–and they are preparing to release her! She has healed and her flights have become strong now; they’d been afraid the day would never come, but it has. Very cool what good people can do. Years ago, I saw the hearse. It was parked across the street as I came home, not your usual suburban-neighborhood sight. Later that day, I saw the college-age son, who was so very grateful at having someone to talk to at his mom’s passing from cancer. His dad remarried a couple years later and moved away–but he did not sell that house. A series of renters came and went, and after the moving vans would leave, the dad and son would be back and working around the place for a day or so. They kept it looking as beautiful as his mother had left it. Rose trees blooming in the front. A new family’s little toddler grew into early school age there–but again, the moving van came just a few days ago. And yet somehow it surprised me to see him across the street this afternoon, and it took me just a moment to be sure it really was him. He was as glad to see me as I was to see him–and I saw in his face what is always clearly there after each gap in time, an, Oh good, you’re still… The lupus and Crohn’s didn’t… Such joy in his face. The little eight-year-old boy who moved into that house all those years ago is now a 30-something good man with a fiancee and a life to begin. In the home where the ’89 Loma Prieta quake swept him clear out of the pool and splashed him onto the ground. A house with stories for him to tell their future children, of his mother’s roses, of her presence. I look forward to pointing out the Cooper’s hawk for them. And maybe even an eight-octave zone-tailed. And hand in hand with their little ones someday, klutzy-footed and all, I shall dance. I wrote about Twinkies last night because I wasn’t quite ready to talk about the news that had just come in. Shadow, almost ready to take his first flight. Shadow, two weeks ago, with his falcon (falcon meaning the female of the peregrine species, tiercel being the male). Come next spring, he would have been of age and they would have been setting up their first nest together. I had never understood the reasoning behind spending money to bury power lines in this part of the world.Â Back home, where hurricanes rip through on a regular basis, sure, but here it’s the earth that is more likely to move and cause damage. Now I get it. There are major power lines criss-crossing major bird flyway territory around the Bay, and word is that he wasn’t the first. 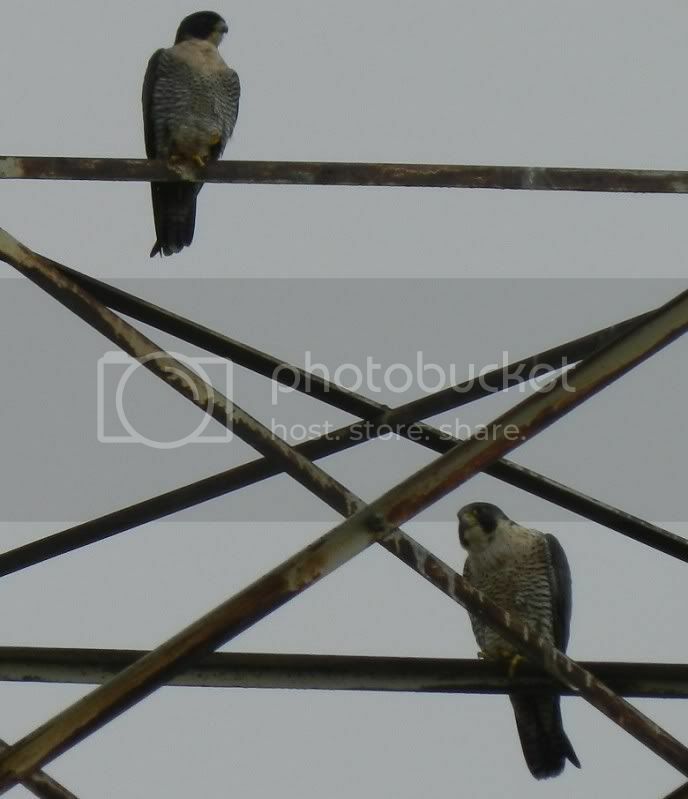 Shadow was stooping (the swift, steep dive that peregrines do at up to a clocked 241 mph) and he hit one of those wires. Apparently one of the birdwatchers saw it happen and got him to the proper rescue authorities, but there was nothing they could do but let him go painlessly. The good news is that the species has recovered enough that this is not catastrophic, just personal. And his falcon, who already has a territory to claim her own, will thus easily find a new mate. And then there was this article, while I was looking for the Newsweek one I read a few years ago. Ingredients mined in Idaho. Fourteen of 20 top industrial chemicals. Yum. Note the January date as it says that Hostess had just filed for bankruptcy.